The following is a list in alphabetical order of all the most important places, events and attractions in Greater Victoria and the surrounding area. This glossary is like an encyclopedia of British Columbia’s capital city. If it’s not here, then it might not be so important. Abkhazi Garden – a garden operated by The Land Conservancy and located near South Oak Bay. Admission is by donation. All Fun Recreation Park – a place with mini-golf, go karts and batting cages by the Western Speedway car race track in Langford. Bard & Banker – a fancy Scottish-themed pub on Government Street. Bastion Square – a small square with shops just off Government Street in the old part of town. Bay Centre – a large modern shopping mall with entrances on both Government Street and Douglas Street in downtown Victoria. BC Ferries – the ferry boat company that transports passengers and their vehicles from Vancouver Island to Vancouver and the Gulf Islands. Beach Drive – a scenic road running along the southern coastline of Victoria. Beacon Hill Park – the city’s large and very popular park close to downtown. Bear Mountain Golf Course – an upscale golf course and residential community. Beaver Lake – a small lake next to Elk Lake that has a small beach, a picnic area and walking trails. The Belfry Theatre – a small local theatre company. Big Bus – a “hop-on-hop-off” sightseeing bus company. Brentwood Bay – a body of water and community located between Victoria and the community of Sidney where Butchart Gardens and Butterfly World are located. British Columbia Aviation Museum – a small airplane museum in Sidney not far from the Victoria International Airport. Bug Zoo – a small educational museum in downtown Victoria that’s popular with small children and features lots of live insects and other creepy critters. Buskers Festival – July’s Victoria International Buskers Festival is the largest street performers festival in BC. Butchart Gardens – Victoria’s stunning and world-famous gardens located in Brentwood Bay. Butterfly Gardens – a small museum with tropical plants, exotic birds and lots of butterflies in Brentwood Bay. Cadboro-Gyro Park – a park and sandy beach located just east of the University of Victoria. The Causeway – a seawall walking area along the stretch of the Inner Harbour in front of the Empress Hotel and Parliament Buildings. Camosun College – a local community college that offers diplomas and university degrees. Camp Pringle – an exceptional children’s residential camp operated by the United Church of Canada at Shawnigan Lake. Camp Thunderbird – a popular residential camp operated by the YMCA in Sooke. Cattle Point – a park on the waterfront in northeast Oak Bay close to the wealthy Uplands neighbourhood of Greater Victoria. Cedar Hill Golf Course – a public golf course with beautiful walking trails in the central part of Greater Victoria. Centre of the Universe – the Dominion Astrophysical Observatory located in Saanich on the way to Brentwood Bay. China Beach – a beach and campground at Juan de Fuca Provincial Park west of Sooke. Chinatown – Victoria’s historic part of town with heritage buildings, shops and Chinese restaurants. Christ Church Cathedral – the Anglican cathedral on Quadra Street. City Hall – the City of Victoria’s municipal government and heritage landmark building on Douglas Street. Clover Point Park – a park along the southern shore of Victoria between Beacon Hill Park and Clover Point on Dallas Road. Coho Ferry – a ferry that takes passengers from Victoria’s Inner Harbour to Port Angeles. Commonwealth Pool – a large swimming pool and recreation centre not far from Elk Lake. Craigdarroch Castle – a beautiful historic house and present-day museum. Dallas Road Waterfront Trail – a paved walking trail at Clover Point Park and the southern end of Beacon Hill Park. Dine Around & Stay in Town – special promotional hotel and restaurant deals in late February and early March. Double Decker Sightseeing Busses – “hop-on-hop-off” sightseeing busses that go to all of Victoria’s main tourist destinations. Douglas Street – a large main Street in Victoria that turns into the Pacific Bay Highway and connects Victoria with the BC Ferries’ Terminal in Swartz Bay. Durrance Lake – a small lake with a beach and walking trails just south of Butchart Gardens. 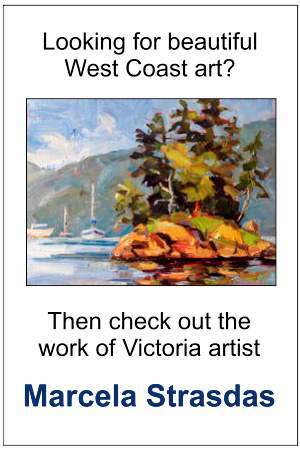 East Sooke Regional Park – a beautiful rugged park west of Victoria. Elk Lake – a lake with walking trails and a small sandy beach that’s popular for fishing and rowing. Emily Carr House – the former home of world-famous BC artist Emily Carr. The Empress Hotel – Victoria’s world-famous landmark heritage hotel in the Inner Harbour. Esquimalt – a small municipality in Greater Victoria that’s home to the Royal Canadian Navy. Esquimalt Lagoon – a lagoon that’s separated from the ocean by Ocean Boulevard in Colwood near Royal Roads University and Fort Rodd Hill. Fan Tan Alley – a tiny narrow alleyway with small shops in Chinatown. Festival of Trees – Christmas tree displays benefiting the BC Children’s Hospital at the Empress Hotel and Bay Centre from mid-November until the beginning of January. Finlayson Point – the southernmost point at Beacon Hill Park. Finnerty Gardens – the public gardens at the University of Victoria. Fisgard Lighthouse – an old lighthouse at Fort Rodd Hill that’s now a National Heritage Site. Fisherman’s Wharf – a popular place for fish and chips and sea lion viewing near Victoria’s Inner Harbour. Fort Rodd Hill – a National Historic Site and former military base on the ocean. Fort Street – a street in downtown Victoria that’s famous for antiques and bookstores. French Beach Provincial Park – a park and beach located west of Sooke. Fringe Festival – a live theatre festival from late August until the beginning of September. Galloping Goose Regional Trail – a 55-km cycling and walking trail that connects Sooke with Victoria. Glendale Gardens – the former name of the gardens at the Horticultural Centre of the Pacific. Goldstream Provincial Park – a beautiful park that’s famous for its salmon run in the fall. Gonzales Bay – a tiny yet beautiful bay with a sandy beach at the foot of Foul Bay Road in South Oak Bay. Gonzales Hill Regional Park – a park in southern Victoria overlooking Oak Bay, the ocean and Olympic Mountains. Gorge Waterway Park – a park along the Gorge Waterway. Gorge Waterway – an inlet that leads into the Inner Harbour. Government House – the official residence of the Lieutenant Governor of British Columbia. Government Street – a touristy shopping street that begins at the Inner Harbour and is home to the Irish Times pub, Bard & Banker pub, the Bay Centre and numerous coffee shops, restaurants and souvenir stores. Greater Victoria Performing Arts Festival – a month and a half of performances between April and May. Harbour Air – a seaplane company with flights from the Inner Harbour to downtown Vancouver. Harbour Ferries – tiny little ferry boats that shuttle people to and from different destinations around the Inner Harbour. Hatley Castle – a stately heritage home and gardens that are open to the public at Royal Roads University. Helijet – a helicopter company with flights between Victoria’s Ogden Point and downtown Vancouver. Helmken House – a historic house and tourist attraction located in Thunderbird Park beside the Royal BC Museum. Hillside Mall – a large urban shopping mall with a Sears, Marshalls and Thrifty Foods. Horticultural Centre of the Pacific – an education centre with beautiful gardens in Saanich. IMAX Theatre – a movie theatre with a giant screen at the Royal BC Museum that often shows National Geographic-style films. Inner Harbour – the body of water at the heart of Victoria where the Empress Hotel, inner causeway and Parliament Buildings are located. Inner Harbour Night Market – a night market that takes place on the main dock in the Inner Harbour in the summer. Irish Times – a popular Irish-themed pub with nightly live music on Government Street. Island View Beach – a sandy beach located a few minutes off the Patricia Bay Highway. Juan de Fuca Provincial Park – a forested park 35 km west of Sooke and home to both China Beach and the Juan de Fuca Trail. Langford – one of Greater Victoria’s various municipalities and home to the Bear Mountain Golf Course, Goldstream Provincial Park, Mount Finlayson and Thetis Lake Regional Park. Langham Court Theatre – a small local theatre. Laurel Point Inn – one of Victoria’s fanciest hotels that’s owned by a non-profit foundation and where profits are donated to charity. Legislative Buildings – the province of British Columbia’s parliament buildings which are located by the Inner Harbour and open for public tours. Lieutenant Governor’s House – the official residence of the Lieutenant-Governor, the Queen’s representative, located on Rockland Avenue and which the beautiful gardens are open to the public. Lower Causeway – the walking area along the waterfront in the Inner Harbour in downtown Victoria which often has buskers and local artists in the summer. Luxton Fair – an annual fair in May that used to be a rodeo. MacPherson Playhouse – a municipal theatre where many of Victoria’s main theatrical performances take place. Magic of Christmas – Christmas lights and activities at Butchart Gardens in December. Market Square – a shopping mall-style place in a group of heritage buildings in the old part of Victoria. Mary Winspear Centre – the community centre and performing arts theatre in the town of Sidney. Mattick’s Farm – a collection of unique shops, a tea house, produce market and mini-golf venue along Cadboro Bay Road. Mayfair Shopping Centre – a large urban shopping mall with a Bay department store, Toys R Us, and numerous other stores. MEC – the giant Mountain Equipment Co-op store on Government Street that sells every kind of outdoor recreation gear you can imagine. Milestones Restaurant – one of Victoria’s most popular restaurants overlooking the Inner Harbour. Miniature World – a museum that features doll houses, toy soldier historical displays and a giant miniature railway. Moss Street Market – a farmers and artisan market that takes place on Moss Street from 10 am to 2 pm on Saturdays in the summer outside the Sir James Douglas School. Mount Doug Park – a fairly large mountain in the Gordon Head neighbourhood of Greater Victoria with walking trails, a small beach and spectacular views of the region. Mount Finlayson – a mountain near Goldstream Provincial Park that’s popular for hiking. Mount Tolmie – a mountain not far from the University of Victoria with spectacular views of the city and ocean. Mount Baker – a snow-capped mountain, ski resort and dormant volcano in neighbouring Washington State that’s visible from numerous locations in Greater Victoria. Oak Bay – one of Greater Victoria’s various municipalities with a small attractive downtown village. Oak Bay Tea Party – an annual fair in Oak Bay that includes amusement rides at Willows Beach in early June. Oak Bay Village – a cute little shopping area along Oak Bay Avenue. Ogden Point – location of a long breakwater pier that people can walk along as well as the terminal for cruise ships and the Helijet helicopter company. Olympic View Golf Course – a nice golf course south of Langford and Colwood not far from Witty’s Lagoon Regional Park. Pacific Bay Highway – the highway that connects the Swartz Bay ferry terminal with Victoria and turns into Douglas Street as it approaches the city. Pagliacci’s – one of Victoria’s best and most famous Italian restaurants. Parliament Buildings – the beautiful provincial government buildings located in downtown Victoria that are also known as the Legislative Buildings. Playfair Park – a small community park that’s famous for its rhododendrons in the spring. Pride Week – a series of events in early July celebrating Victoria’s LGBT community. Prince of Whales– a whale-watching boat company based in the Inner Harbour. Rifflandia Festival – a large 4-day music festival in mid-September. Robert Bateman Gallery – an art museum in the city’s old train station building in the Inner Harbour. Rockland Avenue – a fancy older street in Victoria where the Lieutenant Governor’s home is located. Rogers Chocolates – a famous chocolate company and candy store on Government Street. Royal British Columbia Museum – an exceptional history and anthropological museum in downtown Victoria. Royal Roads University – a university and former home to a military college and present-day Hatley Castle. Royal Theatre – a theatre where many of Victoria’s concerts and other live performances are held. Saanich – Greater Victoria’s largest municipality and home to the University of Victoria, Mount Doug. Elk Lake and numerous other places of interest. Saanich Fair – a country fair with amusement rides and lots of animals that takes place each year over the September Long Weekend. Save-on-Foods Memorial Centre – Victoria’s main arena where ice hockey and major concerts take place. Scenic Drive – the world-famous self-guided car or cycling tour route through residential roads and along the ocean in Victoria. The route goes from downtown at the Inner Harbour to the Ogden Point Breakwater, past Beacon Hill Park, along Dallas Road with its views of the Straight of Juan de Fuca, through Oak Bay and up into the swanky Uplands neighbourhood. An extended version also continues further into Gordon Head, through Mount Doug Park, and along Cordova Bay Road to Elk Lake. Selkirk Trestle – an old railway track that has been converted into a cycling and walking trail. Shawnigan Lake – a lake located 45-minutes from Victoria that’s home to Camp Pringle, one of the region’s best children’s residential camps. Shaw Centre for the Salish Sea – an educational centre and tourist attraction in Sidney. Admission is about $15 for adults, $8 for youth (ages 7-17) and $5 for children (ages 3-6). Sidney – a community at the northern end of the Saanich Peninsula that’s close to the Swartz Bay ferry terminal. Sidney Days – the annual community fair in the municipality of Sidney that takes place over the Canada Day Long Weekend. Sidney Island and Sidney Spit – an island and strip of land with sandy beaches just off the coast of Sidney that’s accessible by a small ferry boat. Sidney Museum & Archives – a small but interesting museum in the community of Sidney. Sidney Street Market – a large and impressive summer market that takes place along Beacon Avenue in Sidney every Thursday evening from May until August. SilverCity Cinemas – the largest of several different movie theatres in Greater Victoria. Songhees – an area of land along the Inner Harbour with an exceptional paved walking trail. Sooke – a small community located about 40 km west of Victoria. Sooke Marine Boardwalk – a beautiful boardwalk along the waterfront in Sooke by Ed MacGregor Park. Sooke Potholes Provincial Park – a park with a river with natural swimming pools that’s popular in the summer. Spinnakers Gastro Brewpub & Guesthouses – a popular pub with its own beer and accommodations on the Songhees. Symphony Splash – an annual event featuring the Victoria Symphony Orchestra and fireworks in the Inner Harbour over the BC Day Long Weekend. St. Anne’s Academy – a National Heritage Site close to downtown Victoria that used to be a large Catholic school. Sticky Wicket – a popular pub on Douglas Street with a great rooftop patio in the summer. Swan Lake – a small lake with walking trails. Swan Lake Christmas Hill Nature Sanctuary – the nature sanctuary that includes Swan Lake and Christmas hill, both of which are popular with birds, bird watchers and hikers. Swartz Bay – location of the BC Ferries’ terminal connecting Victoria with Vancouver and the Gulf Islands. Swiftsure – an international sailing race that takes place to and from Victoria on the last weekend in May. TD Victoria International Jazz Fest – a jazz festival at the end of June and beginning of July. Thetis Lake Regional Park – a popular park with a small lake and forested hiking trails. Tourist Information Centre – a great place to get maps, brochures and general tourist information in the Inner Harbour at 812 Wharf Street. University of Victoria – the third largest university in British Columbia and arguably its most beautiful. Uplands – the wealthiest neighbourhood in Greater Victoria with large mansions and manicured lawns. Uplands Golf Club – a fancy private golf course in Oak Bay. Uptown Market – a large urban shopping centre with a Walmart and numerous other stores. Victoria Bug Zoo – a small educational museum in downtown Victoria that’s popular with small children and features lots of live insects and other creepy critters. Victoria Butterfly Gardens – a small museum with tropical plants, exotic birds and lots of butterflies in Brentwood Bay. Victoria Carriage Tours – a horse drawn carriage company that provides guided tours around downtown Victoria. Victoria Clipper – a passenger ferry that connects Victoria with Seattle. Victoria Convention Centre – the city’s modern conference facilities located on Douglas Street in the historic Empress Hotel and Chrystal Garden buildings. Victoria Day – Queen Victoria’s birthday and a statutory holiday celebrated on the Monday prior to May 25th each year. Victoria Day Parade – a parade that takes place along Douglas Street each year on Victoria Day. Victoria International Airport – Victoria’s main airport located just outside Sidney. Victoria Highland Games and Celtic Festival – Western Canada’s largest Scottish cultural event held at Topaz Park over the May Long Weekend. Victoria Pedicabs – a tour company that uses peddle power to transport passengers around downtown Victoria on the backs of its three-wheeled bicycles. Victoria Symphony Orchestra – the city’s professional orchestra. View Royal Casino – a casino out towards the community of Colwood on the Old Island Highway. Victoria Royals – the city’s major junior ice hockey team. Washington State Ferries – the ferry company that operates the ferry service between Anacortes Washington and the town of Sidney, BC. West Coast Trail – a 75-km hiking trail along the southwestern coastline of Vancouver Island. Western Speedway – a car race track located in the western communities on Millstream Road that’s part of the All Fun Recreation Park which features go karts, batting cages, mini-golf and other fun activities. Willows Beach – a beautiful beach along the eastern coast of Oak Bay. Witty’s Lagoon Regional Park – a park with a lagoon, nature information centre, creek, beach, waterfall and forested trails in the community of Metchosin just south of Langford and Colwood.